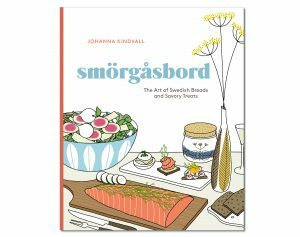 Author Johanna Kindvall joins us in the Nordic Hall to talk about her book Smörgåsbord which offers a savory spin on Swedish baking, pantry, and party cuisine. Johanna’s talk and demo will be followed by a book signing. Books will be for sale at the event. Book sales will benefit programming at the SCC. JOHANNA KINDVALL is a Swedish illustrator who divides her time between a Brooklyn brownstone and her summer cottage in South Sweden. She writes an illustrated food blog, Kokblog, which was named a Saveur “Site We Love.” She is the illustrator and coauthor of Fika: The Art of the Swedish Coffee Break.